Youth in Action (YiA) is a six year learning and livelihood program. In partnership with Mastercard Foundation, the program has improved the socio-economic status of over 41,000 out-of-school girls and boys in rural Burkina Faso, Egypt, Ethiopia, Malawi, and Uganda. YiA provides foundational skills and training to help young people find safe, viable, and sustainable livelihoods for a better future. The program is designed to achieve its goals by using participatory facilitator-led sessions, real world practice, and positive interaction with peers and community mentors. From May 23-24, 2018, YiA program teams, as well as development partners, government stakeholders, and donors came together to celebrate YiA in Kampala, Uganda. Building on YiA’s extensive research and learning from all five countries, the learning event allowed participants to connect and learn about how youth livelihood programs are leveraging resources and opportunities to enhance the socio-economic status of young people in rural Africa. Participants were also inspired to act through the words of YiA’s beneficiaries, who told the audience first-hand about their successes. NTV Uganda, one of Uganda’s leading television stations, was a key communications partner for the event, and devoted its entire morning show to bringing the event’s message to a national audience. During this opportunity, Samuel Mukirane, Save the Children Uganda Regional Western Area Manager, and Stanley Phiri, Deputy Director, Save the Children Malawi, spoke in depth about Save the Children’s work, the YiA program and the needs of rural, out-of-school youth in all five countries. This discussion highlighted the need for programming to address the gender barriers that girls and boys face in accessing education, livelihood opportunities and access to financial services. 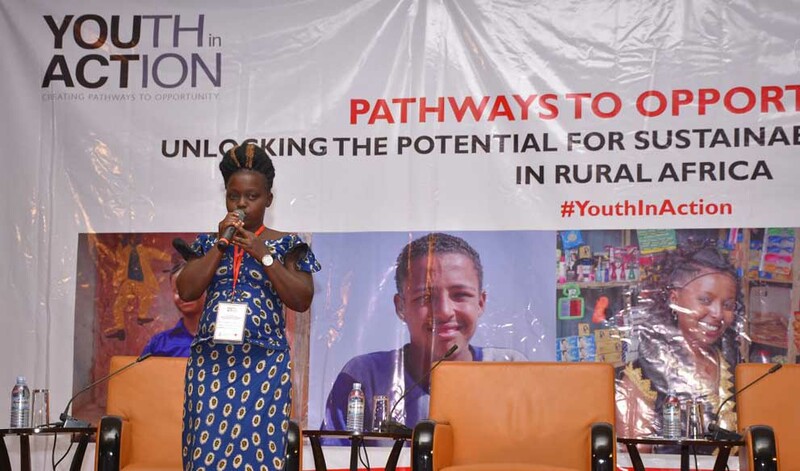 Event attendees heard directly from Ugandan youth, who challenged the audience to see the potential in youth and to work with them to prepare them for successful futures. Through YiA, Save the Children has reached thousands of hard-working youth. Event attendees heard directly from three inspiring Ugandan youth, who challenged the audience to see the potential in youth and to work with them to prepare them for successful futures. Attendees also heard the stories of youth in Burkina Faso, Egypt, Ethiopia and Malawi, such as Diarra. Diarra, from Burkina Faso, had never had the chance to go to school. Through YiA’s work to address gender barriers leading to early marriage, Diarra gained foundational skills and started her own business before her marriage. Hana’s story presents a different challenge – high rates of female migration in Ethiopia. Through YiA, Hana received the skills and knowledge that allowed her to stay in her community. For the past six years, YiA has illustrated the importance reaching youth such as Diarra and Hana through holistic programming and multi-sectoral collaboration. Youth from all five program countries have found success and are challenging themselves and their communities. Save the Children is also working to leverage YiA’s research and learning in future programming. For example, YiA is highlighted as a key program case study in the new Save the Children Common Approach Life Skills for Success, including being promoted as an adaptable model for work with rural young people. Therefore, while YiA’s programmatic lifespan was a “quick” six years, its legacy is set to continue.